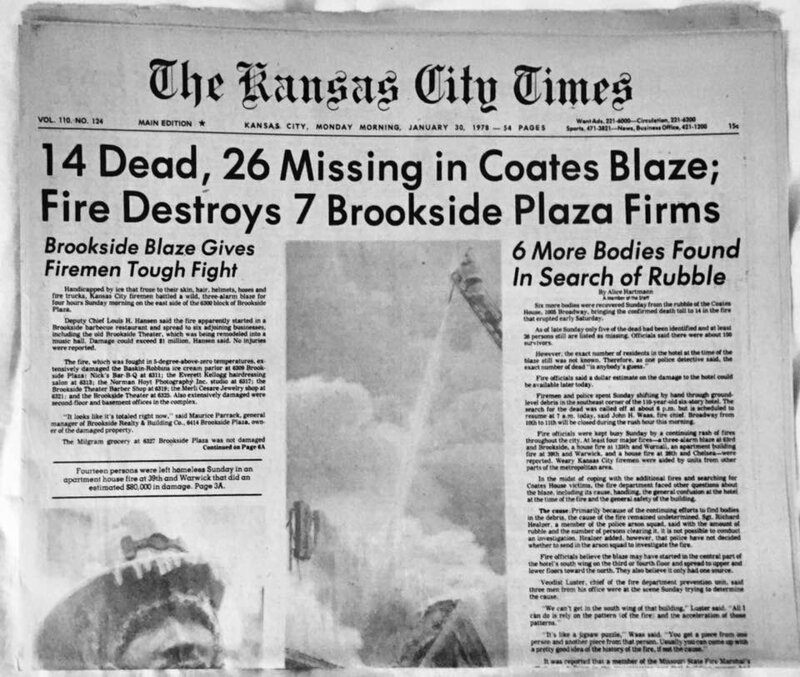 28 January 2019 marks the 41st anniversary of the deadliest fire in Kansas City history. The 92-year-old Coates House Hotel at 10th Street and Broadway had been one of the city's finest establishments. Among its guests were Presidents Grover Cleveland, William McKinley and Theodore Roosevelt. 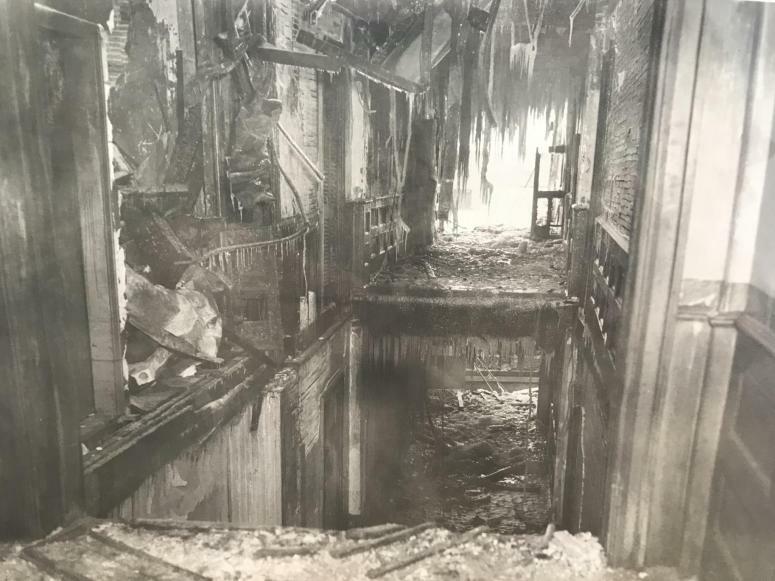 The horrific blaze broke out around 4h10 on a bitterly cold Sunday morning in 1978. Over the years the hotel had lost its lustre. 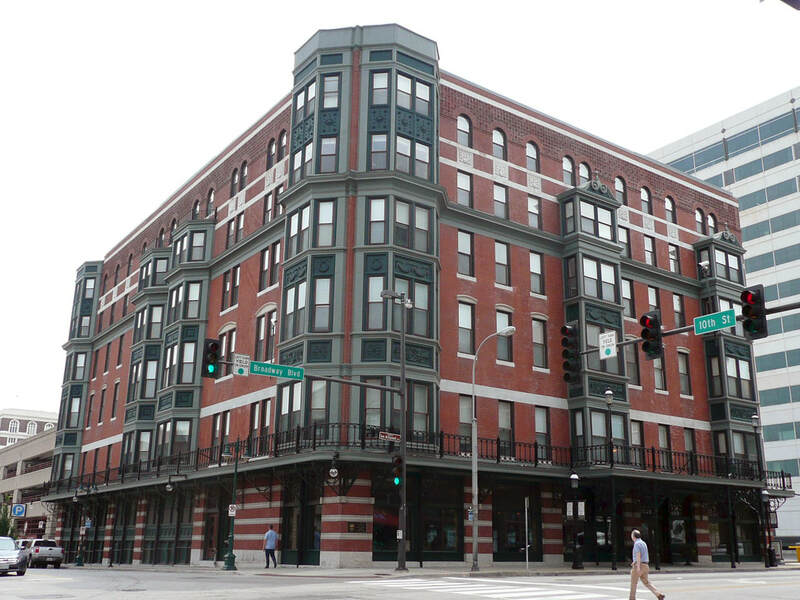 By the 1970s the establishment had been converted to a short-term apartment dwelling where rooms were rented for $12 a week. Within minutes of the original report a second fire alarm was sounded. Deputy Fire Chief Charlie Fisher, at his station at 9th and Paseo, jumped in his car and headed that way. "When I arrived it was probably five to 10 minutes into the fire," Fisher said, now in his 80s. "There was heavy smoke and fire showing in this U-shaped building, it was a pretty good-sized building, about six storeys in height. 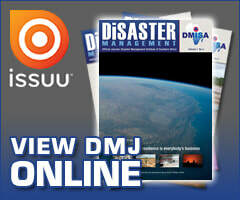 "Fire fighters quickly learned there were people trapped in the building. Their effort was hampered by single-digit temperatures, which froze the nozzles on some of their hoses. Aerial ladders, disabled by ice build-up, could not be extended to their full height. The residents were blinded by smoke, some of them banging on pots and pans to get the rescuers' attention. "People were crying for help, hanging out of the window on the 10th Street side, where we pulled up and set up in the alley," Fisher said. "You could hear people holling for help, very heavy smoke conditions, so we struck a third alarm." Longtime Kansas City reporter Dan Verbeck, heard the news and made his way to the fire. About 90 fire fighters took part in the effort to put out the fire. They used 23 pieces of fire apparatus. "It was a huge response," Verbeck said, adding that the KCFD eventually signalled a 5th alarm, the largest effort ever for a single event. "They put everything they had into it but they couldn't do very much." Some victims had no choice but to jump to their deaths to avoid being consumed by the flames that tore through the south wing of the building. One person, badly burned, was frozen in ice from a window. "That body sticking out that window for a day before they could pry the remains loose," Verbeck said. Fisher said fire fighters made many rescues, including two of the most heroic he had ever seen. Capt. Howard Hutchison took a ladder up to a 5th story window in an effort to assist a man out a window on the 6th floor. "Howard Hutchison talked him into reversing his position and lowering himself out of the window to reach his shoulders," Fisher said. "He was in a window sill right below him and he held him against the wall and lowered him to the top rung of the ladder and brought him down successfully." It took about four hours to get the fire under control. 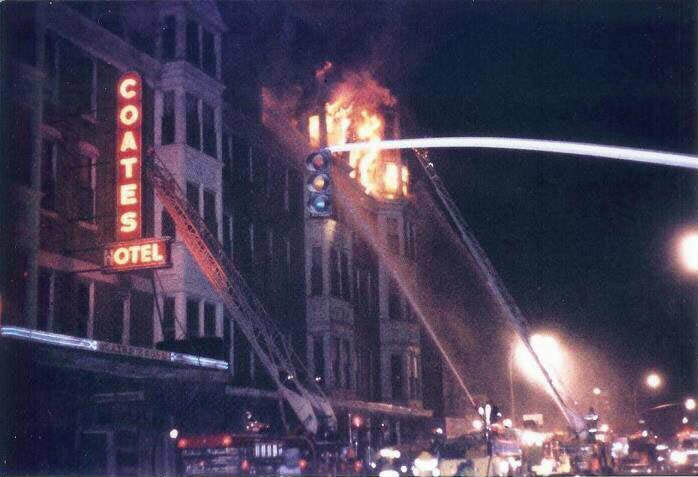 Thirty-six hours after the fire started, the Coates House Hotel was still smouldering. Twenty people died but the people who were there note that 150 residents were spared. The cause of the fire was never officially determined. One unconfirmed theory was that a tenant accidentally started the fire while repairing a motorcycle inside a room on the fifth or sixth floor. Fisher remembered a storage room that will filled with old mattresses and furniture, providing a lot of fuel for the flames. 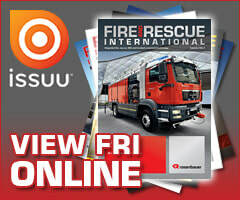 The fire occurred at a time of great turmoil between the city government and the KCFD. Under a fire improvement plan, the city implemented eight-hour shifts, forcing out many experienced fire fighters, closing fire stations and reducing staffing levels. Many fire fighters at the time were relatively inexperienced. "Consequently we hired a whole lot of people that were brand new," Fisher said. "A number of them were at the Coates House." One reason for the great loss of life was an antiquated alarm system, which did not appear to be working, Fisher said. The only way to activate the alarm was to go to the front desk on the ground floor. 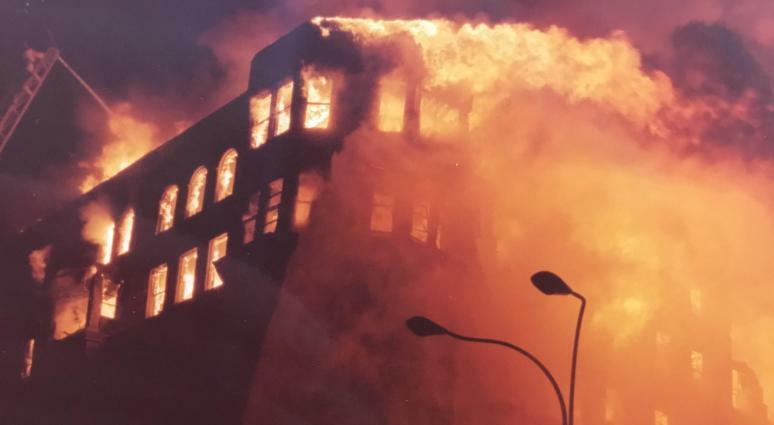 Today Fisher remembers the Coates House Hotel fire for the horror he witnessed, driving by 10th and Broadway he still remembers people hanging out of windows, screaming for help. He also remembers the heroism of his men whose work allowed 150 people to escape.